Why don't electric fish shock themselves? Fish like electric eels and torpedoes have specially designed nerve cells that allow them to discharge hundreds of volts of electricity. Now, while pure water is usually nonconductive, the dissolved salts and other stuff in both sea and fresh water allow them to be conductive. 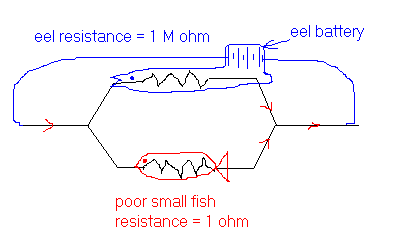 If an electric fish is able to use its electricity to stun enemies or prey, how come the fish itself is unaffected? This is probably the large picture but I am just guessing. Hope its correct. 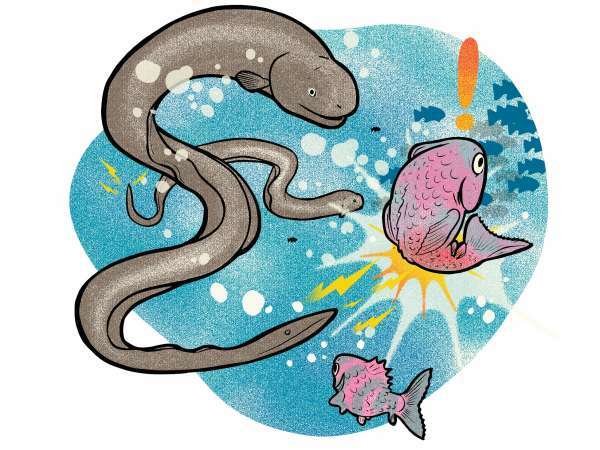 The simple answer is that electric eels insulate their critical tissues with a layer of fat below the skin, preventing the shock from traveling through their body as the "path of least resistance". I may update with visuals and details if I can find good ones. the electrical eel is a variety of freshwater fish with specialized organs that discharge energy. Many species use those jolts to experience their environment or communicate (as in courtship). some species, such as electric powered eels, electric rays, and electric powered catfish, can emit enough juice to stun other fish, yet they in no way appear to surprise themselves. frame size may be key: An electric eel can develop to 8 ft long and weigh as plenty as 50 kilos, making it orders of magnitude bigger than its sufferers. The price it promises--as much as 650 volts--could purpose a good deal much less harm to the eel itself. why do lightbulbs sometimes unscrew by themselves? Why don't neutral atoms distort the electric field? Why don't we feel shock when there is lightning? Which is a correct term-'Voltage shock' or 'current shock' or 'Power shock'? Electrical shock, why should I get it?